Ikoyi is an island that is separated by a narrow waterway from mainland Lagos to the west that boasts of upmarket residential properties. It is just a stone’s throw away across the waterway to Victoria Island that has a wide choice of restaurants, cinemas, shops, schools, hotels and business headquarters. 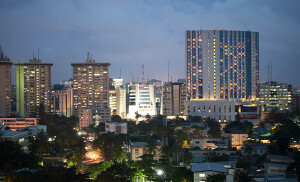 Originally designed to be a residential area for the expatriate community by the British colonial governments of late 1800s to early 1950s, Ikoyi is presently home to top government officials, diplomats, and leading local businessmen as well as expatriates working in top management positions throughout the Oil and Gas industry. Consequently, many prominent enterprises thrive in Ikoyi, such as KPMG, Julius Berger, Zenon, and Intercontinental WAPIC, to name a few. Ikoyi is also home to numerous shopping plazas including the Kingsway shopping centre, Dolphin estate shopping centre, Golden Gate Plaza and City Mall located in Onikan. Moreover, a large number of fashion houses, boutiques, salons clothing stores, restaurants/bars can be found on the busy Awolowo way. Supermarkets and pharmacies are aplenty not only in Awolowo way but also in the other non-residential areas of Ikoyi. Other landmarks as well are Lagos Polo Club, Ikoyi Club and Southern Sun Hotel. Lastly, the architectural and urban heritage of Ikoyi embodies its urban experience through such landmarks like the Court of Industrial Arbitration, Kings College, Corono School, Federal High Court, Dodan Baracks, and JAMB Secretariat, Niger Towers, Kingsway Road (now known as Alfed Rewane Road), Awolowo way, former federal secretariat, Voice of Nigeria, Radio Nigeria and the former Police Headquarters. The sprawling metropolis of Lagos is benefitting from the glory of its resurgence. Focusing on socio-economic and political platforms, Lagos sees to see the full development of the middle class and the service industry. Lagos city-state, one of the most progressive and promising cities in Africa sees itself as an epitome of a conglomeration of cities – a New York / Miami / Singapore rolled into one. At the centre of this development rises a new landmark, Maansbay, in one of most important and exclusive addresses in Lagos. 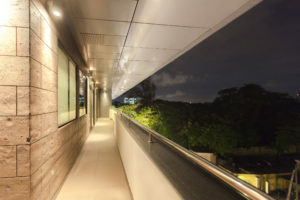 Located at 8 Oyinkan Abayomi Drive (formerly ‘’Queens Drive’’) in Ikoyi, Maansbay not only represents the first of many real estate ventures for Lababidi Holdings Real Estate (LHRE) but more importantly, Maansbay serves as a beacon to future exciting developments in Lagos. The Federal Republic of Nigeria is a federal constitutional republic consisting of 36 states along with its Federal Capital Territory, Abuja. In terms of geography, Nigeria shares its frontiers with Cameroon as well as Chad to the east, Niger to the north, and the Republic of Benin to the west. However, unlike many of the nation-state’s landlocked neighbours, Nigeria has coastal access to the Gulf of Guinea on the Atlantic Ocean, thereby, allowing for lower transport costs and a competitive advantage in export opportunity. Economic reforms of the post-autocracy period have re-stabilized and re-focused the nation-state, consequently allowing Nigeria to begin to capitalize on its full economic potential. As such, Nigeria is an emerging middle income, mixed emerging market with a multitude of developing sectors, ranging from finance, legal to telecommunications as well as transport and entertainment. While Nigeria is currently ranked as the 3rd largest economy in Africa, behind only South Africa and Egypt, economists project that within ten years, the GDP of Nigeria is to double the GDP of South Africa. More explicitly, Nigeria has continued to display dynamic growth from 2008 to 2010 with GDP increasing from 6% to 8.4%, respectively. Given the relationship between GDP and inflation, the rapid growth rates has, unsurprisingly, yielded a substantial surge in inflation from 5.4% in 2007 to 12.3% in 2010. Furthermore, Nigeria boasts Africa’s third-largest manufacturing sector. According to the IMF, Nigeria posted a GDP (PPP) of USD 380.2 billion in 2010. In terms of GDP (PPP) world rankings, the IMF designates the 31st position to the nation-state whereas the World Bank ranks Nigeria 30th in the world. The country’s stated official goal is to join the G-20 by 2020. A comprehensive study of publicly traded companies operating in Africa from 2002-07, mostly in manufacturing and service sectors, found that they had an average return on capital that was two-thirds higher than comparable companies in China, India, and Indonesia.